Built as a wizard, the user interface is a 3-steps process offering a maximum user comprehension while minimizing possible inputs errors. What you just have to do is follow the different steps of the wizard. All the screenshots on this tutorial are active and you can use their buttons to navigate thru the tutorial. 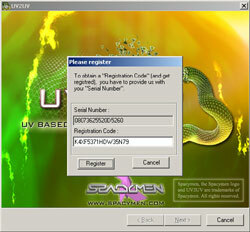 You can also click on a screenshot at any step to launch an html UV2UV simulation. This first screen is for information only. This screen provides Spacymen copyright informations and access to the Spacymen's website. The access to our website can be found on every UV2UV screens. UV2UV needs 3 inputs in order to work. Just locate your source files. The main goal of UV2UV is to create a new target texture file as a bitmap (.BMP 24 bits). Name and locate where to save it. The size of the resulting bitmap is initially set to 1024 x 1024 (width by height). You can set it to whatever value you like. But increasing the size of the resulting bitmap will also increase rendering time and size on disk. Optionally, you can also ask UV2UV to create a new .OBJ with its own Material library (Mtllib). This option is usefull if you intend to render your object right away. This UV2UV resulting .OBJ is ready for rendering because it references the new Mtllib. At this stage, you are ready to render. Make sure that all your previous choices fit your needs by reading the resume. If not, use the "Previous" button to make the desired changes. When you are stisfied with the settings just click on "Next" to render. A progressbar will show during the rendering process. If you want to see the resulting bitmap, check the "Launch default viewer" checkbox. This will open the resulting texture using your actual default viewer after rendering. This screen only shows after rendering has completed. A resume of the rendering status is displayed with statistics on both the objects and the bitmaps used. If you have checked the "Launch default viewer" at the previous step, your resulting texture is also displayed in your default viewer. Note that you are not able to use the "Previous" button at this stage. Use "Next" to keep using UV2UV and go back to the first screen or "Cancel" if you want to quit. You have successfully completed this tutorial. Now just import the new .Obj file in your favorite 3D package and render.